West Bay, Dorset - Website Recognition and Domain History. Needless to say, we are proud that the West Bay webcam features on the Dorset section of the British Broadcasting Corporation's website (www.bbc.co.uk/dorset). However, when asked by them if we would help with the launch of their new website, we were happy to oblige. The BBC wished to make a promotional film to coincide with the official launch of their Dorset site. 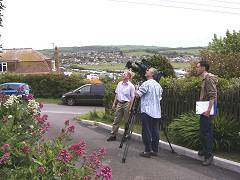 The total length of the film was to be one hour, with about five minutes devoted to West Bay and its website. Sections of the film would also be broadcast on tv and radio. They visited our premises on Sunday, 29th May 2005, where they were shown how the website and its webcam are maintained. 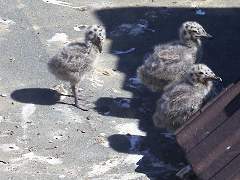 They were also shown the reason why sometimes it is not always possible to obtain access to the webcam. 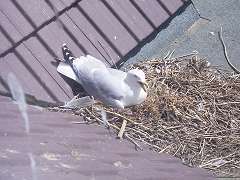 Fortunately, since the launch of the West Bay webcam on 28th August 2004, we have been able to overcome the many technical difficulties involved and have maintained an image on the webcam page. 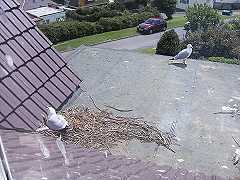 Below are some pictures from that day, together with Seagulls standing guard over their nest (and our webcam). 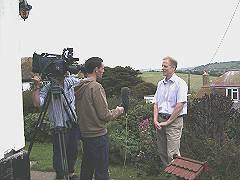 BBC Broadcast Journalist interviews West Bay's webmaster Technical discussion as to how the West Bay webcam is maintained Watching You Watching Me. Because West Bay's website is independently run (by enthusiasts, not website designers or holiday accommodation owners), we are not restricted by 'official' red tape. We just use our common sense and hope that you approve of our efforts. Funding is by ourselves, subsidised by advertising. No other business activities are operated through the website. But perhaps most importantly, we dominate the major search engines like Google, MSN and Yahoo for most subjects relating to West Bay Dorset, e.g. accommodation, bed & breakfast, guest houses, restaurants, fishing, jurassic pier, properties, etc. But rest assured that we will consolidate our position for West Bay on behalf of our community, our visitors and our advertisers. Following a year of watching and waiting, we finally secured the domain registration of 'www.westbay.co.uk' for this website around the beginning of March 2005. 'www.westbay.co.uk' has been in existence since around the early 1990's (or even before), long before Nominet UK was set up in 1996 to regulate domain name registrations in this country. The website address had not been actively in use for some years, but Nominet had to go through the procedure of tracing and notifying its owners of the requirement to register the domain name or forfeit its ownership. Unfortunately, we were not the only ones watching. The buying and selling of high profile domain names is big business and specialist software exists to monitor and snap up important registrations seconds after they become available. A domain names broker got to 'www.westbay.co.uk' before us, causing us to purchase it from them. We consider it worth the money for the benefit of West Bay. 'www.westbay.co.uk' has finally arrived at its rightful home of West Bay, Dorset. We have checked through website archives to try to discover the previous use of 'www.westbay.co.uk', but have failed to find anything. Intriguingly, a search on various engines did find some evidence of its previous life, showing e-mail addresses '****@westbay.co.uk' where jokes had been posted on a forum website a few years ago. The website for West Bay, Dorset, originally went live on 27th June 2004 with the domain name of 'www.west-bay.co.uk'. However, there was a previous history for 'www.west-bay.co.uk', because until February 2004 it had been the website address for a building and construction company in Scotland. The domain name was relinquished following the company's liquidation and re-registered by us to launch this website.